This story is kind of funny... scratch that. It is funny! 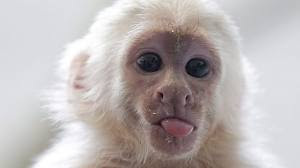 Mally the monkey was seized by German customs on March 28 when the pop star failed to produce required vaccination and import papers for the animal after landing in Munich. He had until midnight on Friday to produce those documents. Customs spokesman Thomas Meister said after offices opened following a holiday weekend that officials received no documents. He said the customs authority will formally transfer ownership of the animal to the German state on Tuesday. Bieber will then have six weeks to contest the decision. It was not immediately clear when authorities will make a decision on the monkey's permanent home. Mally, a capuchin monkey, has been cared for at Munich's animal shelter since being taken into quarantine.